As the Secretary General of the United Nations, an organizations of the 147 member states who represent almost all of the human inhabitants of the planet earth, I send greetings on behalf of the people of our planet. We step out of our solar system into the universe seeking only peace and friendship, to teach if we are called upon, to be taught if we are fortunate. We know full well that our planet and all its inhabitants are but a small part of the immense universe that surrounds us and it is with humility and hope that we take this step. ↑ Lafrance, Adrienne (30 June 2017). 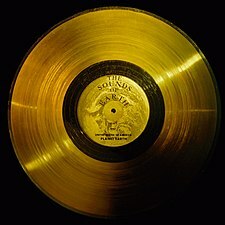 "Solving the Mystery of Whose Laughter Is On the Golden Record". The Atlantic. สืบค้นเมื่อ 1 July 2017. ↑ "NASA Spacecraft Embarks on Historic Journey Into Interstellar Space". NASA. September 12, 2013. สืบค้นเมื่อ April 15, 2014. ↑ "Voyager – Interstellar Mission". Jet Propulsion Laboratory. NASA. January 25, 2010. 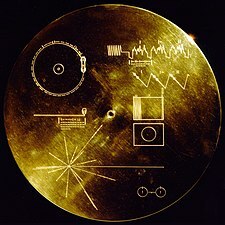 ↑ "Voyager – Golden Record". NASA. สืบค้นเมื่อ September 23, 2010. หน้านี้แก้ไขล่าสุดเมื่อวันที่ 11 สิงหาคม 2560 เวลา 23:54 น.